I'm delighted Doris Meissner has responded to my critique of the report she co-authored for the immigration-expansionist Migration Policy Institute, which falsely claims that we spend more money on immigration enforcement than on all other federal law enforcement combined. It gives me an opportunity to highlight a more lengthy critique of Meissner's report by one of my colleagues, Jessica Vaughan, which looks at a number of the report's "false statements, cherry-picked statistics, and inappropriate comparisons." In her response, Meissner never defends the core message of the report, which is, as the very first words of MPI's own announcement put it: "The U.S. government spends more on federal immigration enforcement than on all other principal federal criminal law enforcement agencies combined." The political goal of such a message is to create the impression that we now have in place an adequate (maybe more than adequate) enforcement infrastructure to proceed with amnesty. And, of course, the point of the exercise was commentary like this: "With enforcement tightened, time for immigration reform." The argument that we have enough enforcement to warrant moving on to amnesty (aka, "immigration reform") is certainly plausible. It's clearly incorrect, but can be made honestly. But, as Vaughan points out in detail, MPI's report cherry-picks numbers to reach the all-important more-than-all-other-federal-law-enforcement-combined statistic. You can read the critique, but a few examples: On the "other federal law enforcement" side of the ledger, MPI does not count the federal prison system and the U.S. Attorneys, even though it includes similar program expenses for Immigration and Customs Enforcement (ICE) and Customs and Border Protection (CBP). Also, Meissner, in her NRO response, justifies including CBP's function of screening arriving passengers from abroad as law enforcement, but the report doesn't include TSA's budget on the other side — if one is law enforcement, so is the other. Since, as Meissner protests, "it is not possible to break down functions within these agencies" — i.e., ICE and CBP encompass functions formerly undertaken by the Customs Service as well as the INS — then why wasn't the Customs Service budget from 1985 (before the two agencies were reshuffled and folded into DHS) included in the left-hand bar graph, to give a more realistic picture of growth in spending? The 1985 budget of the Customs Service was $725 million, more than that of the INS, and including it would have offered a more accurate — but less dramatic — picture. Alternatively, the report's authors could have offered a rough estimate of the share of customs-related activities in today's ICE and CBP by inflation-adjusting the last independent Customs Service budget (from FY 2003 — it comes out to about $4.4 billion) and subtracting it from the 2012 total. But you can't exclude Customs from the "before" picture and include it in the "after" picture and claim you're being honest. If you've read this far, you probably already have an opinion as to whether our current immigration enforcement is adequate. But you're not the MPI report's target market. 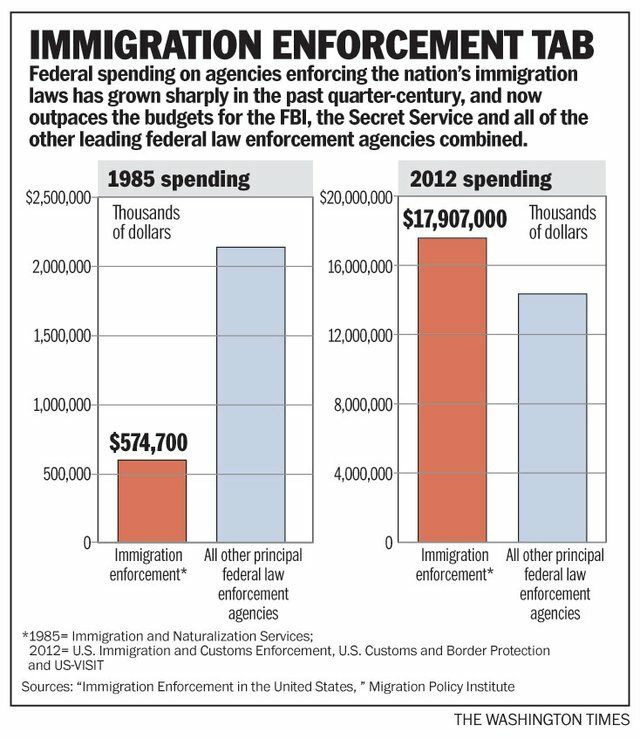 The point of the more-than-all-other-federal-law-enforcement-combined factoid was to get it widely enough disseminated in the media that it would become an accepted part of the immigration debate and be hard to debunk, like Bush's supposed 44 percent share of the Hispanic vote in 2008. In the coming debates over immigration, expect to hear Meissner's factoid cited repeatedly by amnesty supporters from both political parties.